I’ve never had Egyptian food before, I knew it was Mediterranean food but wasn’t exactly sure what to expect. So when D called and suggested we have lunch here, we (J and S) said yes. I think they have all been here before, but this was new to me, and was looking forward to it! It was a very casual place on Wellington Street, in Central and the place was bustling with diners. First thing I noticed when I walked in was that it was quite dark and it was a sunny day in Hong Kong. I’m not usually a fan of dark restaurants, as I like to see what I eat! I was a little late (no, not lost, just running late) and both D and S were there already. We were still waiting for a stressful J to come, however, he arrived shortly after I did. The menu is quite extensive, and they had special set lunches for different days during the week which made it very confusing and way too many options! D, S and J had the set lunch, which was a choice of either spinach ricotta pie or meatball with vegetable soup, kochary (Egyptian noodles), salad and hummus, pita bread and a drink. Both S and D had the spinach ricotta pie and they both totally utterly enjoyed it. 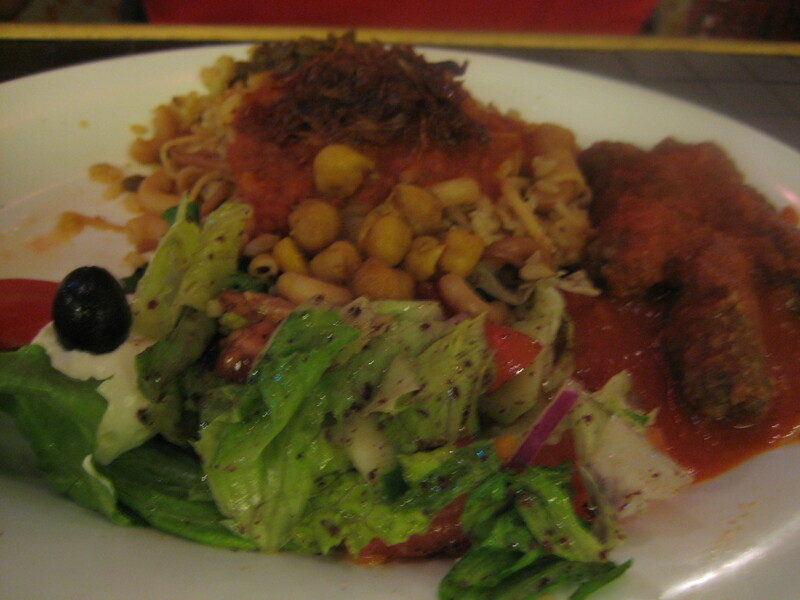 J had the meatball with vegetable soup, kochary, salad, and hummus, which also came with pita bread and a drink. I didn’t have any of the meatballs, however, the hummus and kochary were fantastic! It was a LOT of food! I doubt that I would have been able to finish it, but the boys managed too! I ordered the chicken kebab, and it wasn’t what I expected! 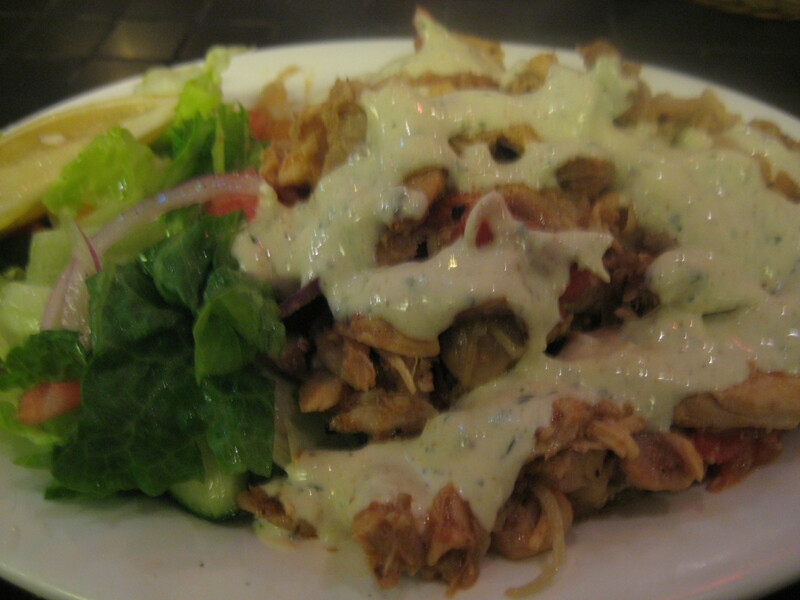 I was expecting chicken wrapped in pita bread with all ingredients like a kebab, however, it was shredded chicken with onions, beans, tomatoes with yogurt on top. The chicken was tender, and full of flavour. It was absolutely delicious and the yogurt was a great compliment. It was also a very very generous serving. I didn’t think I could finish this, but managed too and was seriously and utterly deliciously stuffed! It was indeed fantastic! 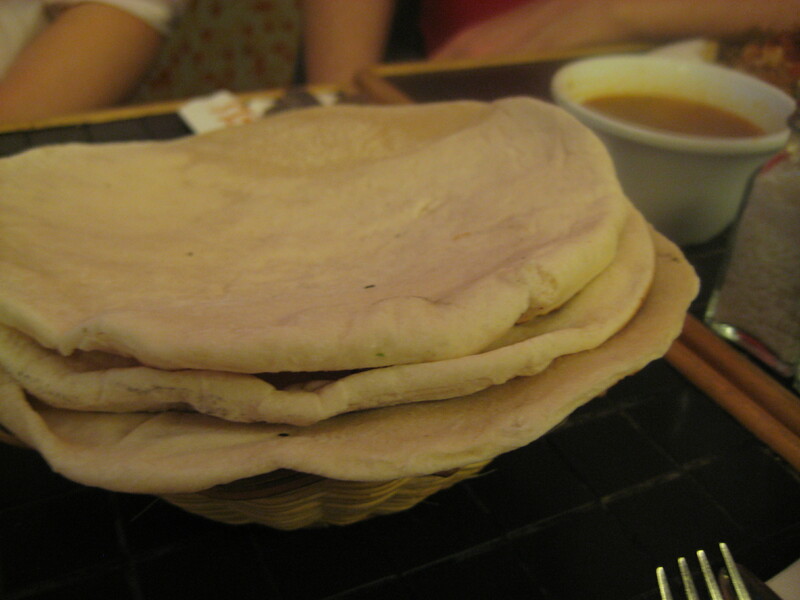 All the above meals came with pita bread which was served warm! 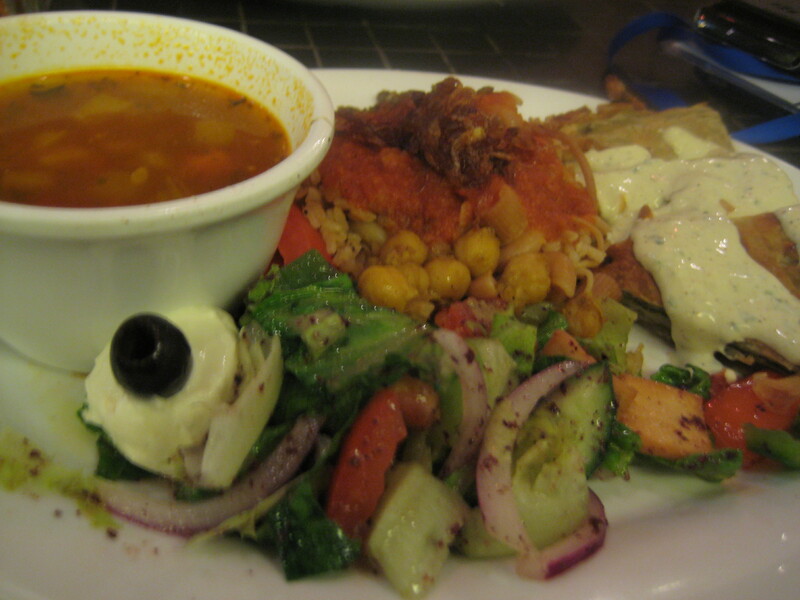 If you like Mediterranean food – beans, lentils, seed and yogurt – then this is the place for you. The set lunches are reasonable priced, and the food delicious.